I had a hard time deciding which recipe I should post as my very first one on the blog….I went back and forth numerous times, but then decided this should be my very first recipe, because it’s one of my favorite recipes of all time…..EVER! And why not, right?….I did just post a lot of my favorite things recently. 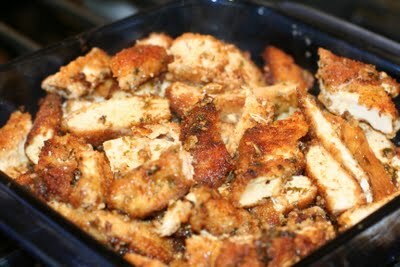 I promise this chicken dish will not disappoint and could possibly become a favorite in your house too. This recipe came from my Uncle Ricky……..but my Nana took to making it often..which is funny because they are on separate sides of the family. She probably got this recipe during one of our large (Italian) family parties or dinners! Olivia often asks me to make it…..and how can I say No? 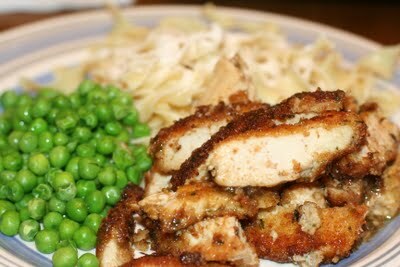 Aside from frying the chicken cutlets…the recipe is very quick and easy! I mean frying cutlets isn’t the worst thing ever, but it gets time consuming and messy…and anyone who knows me, knows I LOVE to cook….but cleaning it up is my worst nightmare! So the little splatters of oil everywhere…are all worth while once you take a bite of this deliciousness! Fry in a frying pan until cooked…golden brown and cooked through. 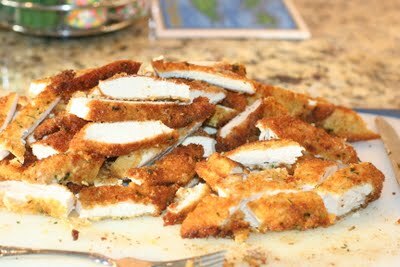 Remove all chicken from pan and slice into bit sized strips. Leave 4 TBSP of leftover oil that you fried the cutlets in. To that add garlic, the juice of the lemons, cooking wine, butter and parsley. Allow this whole mixture to get hot…..you do not have to “cook” it. In Pyrex or any kind of baking pan put 1-2 TBSP of juice just to coat the bottom. Add one layer of chicken strips. Add remaining (if any) chicken. Put in oven JUST TO HEAT, for 10-15 minutes. This is the best chicken ever!!! Now im starving! It really is! Thanks to your Dad! !